A high school freshman sits in a grass meadow where two mountain ridges slope down and join. As the young observer gazes across the landscape, he sees a scar on the neighboring ridge. At first it looks like a rockslide or scree slope, but on closer examination he sees a hole in the mountainside. It is an abandoned mine with a waste rock pile at its entrance. An orange-red liquid slowly trickles down from the mine into the forest until it reaches the headwaters of a crystal clear mountain creek teeming with small fish and insects. The volume of clear, cold water flowing overwhelms the orange-red liquid and it disappears. Returning 8 years later as a college graduate, the observer encounters a much different scene. The meadow is now a wasteland without vegetation, and the once healthy creek is flowing red in the headwaters. The observer follows the creek downstream to see it change from red to white to turquoiseblue; no fish or insects appear for several kilometers downstream. What has happened? The answer is acid mine drainage. Specifically, in the first visit, the high school student saw acid mine drainage from an old mine that had been worked with crude equipment, likely producing no more than a couple tons of ore a day. Acid mine drainage from this old mine was not significant enough to negatively affect the creek. The following year, however, the mine had been reopened. The newly opened mine operated with high efficiency using modern equipment and produced from 350 to 450 tons of ore per day. 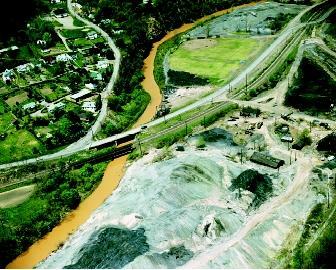 Owing to the larger disturbance and production methods, the acid mine drainage from the modern mine had a significant impact on an entire watershed . This scene actually played out in the Siskyou Mountains of southwest Oregon. The Formosa Mine initially operated between 1927 and 1933. The mine re-opened in 1990 and produced from 350 to 400 tons of copper and zinc ore per day. The ore was crushed into powder and processed using ponds to separate the metals. Upon closure in 1994, the mining company placed the leftover crushed high-grade ore back into the mine workings and filled the former flotation ponds with the gangue or low-grade ore. The following winter, the mine workings and former ponds filled up with water from rainfall and began producing acid mine drainage (AMD) as the ore reacted with the water. Big Wheeling Creek in Lansing, Ohio is shown here in 1972, when it was polluted with sulfuric acid, iron pyrites, and other mine runoff. Reclamation efforts can slowly return polluted sites to a more acceptable state. AMD from the mine flowed into the headwaters of two nearby creeks, which were habitat for threatened salmon and steelhead. Studies performed before 1990 documented an abundance of aquatic insects and fish in both creeks. After the mine closed, the creeks flowed red, white, turquoise-blue, and blue-green as the metals in the AMD precipitated out into the streambed. A total of 29 kilometers (18 miles) of stream were contaminated with metals from the AMD. Eighteen kilometers (11 miles) were found to be mostly void of aquatic insects, and fish populations were reduced by over 90 percent. Acid rock drainage (ARD) is a natural process in which sulfuric acid is produced when sulfides in rocks—for example, pyrite (FeS 2 )—are exposed to air and water. This occurs along outcrops or scree slopes where sulfide-bearing rock is naturally weathered . Acid mine drainage (AMD) is essentially the same process as ARD only greatly magnified. In general, rocks that contain valuable metals usually contain sulfides (metals combined with sulfur). The reason for this marriage (metal deposits with sulfide or sulfur) is that thermal waters are typically responsible for depositing many types of metallic ore. These thermal waters travel along fractures or small channels in the host rock. As a result, the thermal waters also change the mineralogy of the host rock along these fractures, creating bodies of rock referred to as hydrothermal alteration zones , which may be many times larger than the economically-defined ore zones or veins that fill the fracture. Gangue minerals are the nonvaluable minerals closely associated with the valuable ore deposits. They generally include minerals like quartz or calcite. During mining activities, the gangue material is commonly discarded as waste rock or low-grade ore in an effort to extract more valuable ore minerals found in the veins. AMD is typically associated with these types of hard rock mines across the world. Another major form of AMD is associated with coal mines in the eastern United States (and elsewhere around the world) where acid is formed by the oxidation of sulfur occurring in the coal and the rock or clay found above and below the coal seams. When the minerals in the rock were deposited millions of years ago, they were formed at high temperatures and pressures. This makes these mineral deposits (including the gangue material) unstable under surface conditions when exposed to oxygen and water. Most sulfide minerals react with oxygen (oxidation) and water (hydration). Some sulfides, especially those containing iron and copper, generate sulfuric acid in the process. Pyrite (commonly called "fool's gold"), the most common sulfide mineral, reacts with oxygen and water to form ferrous iron and sulfuric acid in solution (see box above). Laboratory studies have shown that exposing sulfide minerals to oxygen and water produces sulfuric acid, but scientists found that the rate of generation is so slow that it would take decades to oxidize a significant proportion of sulfide. Observations of AMD and other natural systems clearly demonstrate that acid production occurs in a short time period, from months to years. This is because some common strains of bacteria present in almost all environments increase the reaction rate by orders of magnitude. Once the acid is formed it leaches other metals, such as copper, zinc, cadmium, nickel, arsenic, lead, and mercury, from the mineralized vein. High concentrations of these metals are dissolved by the acid and carried away in solution. As the acid solution flows away from the mine, the pH changes and affects the chemistry of the solution such that different metals begin to precipitate out of solution. Color changes typical of creeks affected by AMD start as orange, red, or yellow-brown as the ferrous iron solution is diluted. The pH rises as the AMD mixes with the receiving stream, causing the ferrous iron to precipitate out as ferric iron. Farther downstream, the stream is white as aluminum oxide deposits along rocks and the streambed. The iron and aluminum deposits tend to form a sludge-like material, which inhibits algae , insect, and fish growth, and damages their habitat. Benthic (bottom-dwelling) organisms are particularly sensitive to this type of pollution. Following the orange iron and white aluminum deposits, the streams can then take on turquoise-blue or green colors as copper and other metals begin to precipitate from solution. Depressed food supplies, gill clogging, and smothering by iron or aluminum precipitates, along with direct toxicity from ingested metals, contribute to the significant decline of fish, insect, and benthic communities in streams polluted by metal oxides. With their food supply diminished, fish populations can be limited even when degradation is not severe enough to cause direct poisoning of individual fish. Acid mine drainage is a global problem. In the eastern United States alone, AMD from coal mines has adversely impacted fisheries associated with over 13,000 kilometers (8,000 miles) of streams in Pennsylvania, West Virginia, Ohio, and Maryland. The problem in the western United States is less studied, yet it has become apparent that once-pristine watersheds are suffering from the effects of AMD. Cleanup of abandoned mine sites is difficult because of their remote locations and because these problems will go on for hundreds of years until the mineralized rock is leached free of sulfides and metals. Using concrete or cement to solidify the acid-producing material into an inert block. To be effective in eliminating or significantly reducing AMD, it is necessary to remove one of the three factors that produce it: water, oxygen, or bacteria. SEE ALSO Ecology, Marine ; Fresh Water, Natural Composition of ; Fresh Water, Physics and Chemistry of ; Salmon Decline and Recovery ; Stream Health, Assessing . Brodie, Gregory A. "Constructed Wetlands for Treating Acid Drainage at Tennessee Valley Authority Coal Facilities." In Constructed Wetlands in Water Pollution Control, eds. P. F. Cooper and B. C. Findlater. New York: Pergamon Press, 1990. Jambor, J. L., and D. W. Blowes, eds. "Environmental Geochemistry of Sulfide Mine Wastes." Mineralogical Association of Canada, Short Course, 1994. Morin, Kevin A., and Nora M. Hutt. Environmental Geochemistry of Mine Site Drainage: Practical Theory and Case Studies. Vancouver, B.C., Canada: MDAG Publishing, 1997. Ritcey, Gordon M. Tailings Management: Problems and Solutions in the Mining Industry. New York: Elsevier Publishing, 1989. Smith, Kathleen S., Geoffrey S. Plumlee, and Walter H. Ficklin. "Predicting Water Contamination from Metal Mines and Mining Wastes." U.S. Geological Survey Open-File Report 94-264 (1994). Sobolewski, Andre. "A Review of Processes Responsible for Metal Removal in Wetlands Treating Contaminated Mine Drainage." International Journal of Phytoremediation vol. 1, no. 1 (1999):19–51. Koryak, Michael. "Origins and Ecosystem Degradation Impacts of Acid Mine Drainage." U.S. Army Corps of Engineers. <http://www.lrp-wc.usace.army.mil/misc/AMD_Impacts.html> . The iron sulfate and sulfuric acid continue to react with water and air through several steps to produce iron hydroxide (Fe[OH] 3 ) and additional sulfuric acid. The sulfuric acid is responsible for leaching metals from mine dumps as well as significantly lowering the pH in streams. The iron hydroxide is responsible for the characteristic reddish color associated with AMD. Although operating more slowly, the reactions described above do affect natural outcroppings of sulfide ore minerals, resulting in a characteristic reddish stain that is referred to as a gossan. The color of the gossan is so distinctive that it can be seen for miles. Early mineral exploration made use of gossans as an indicator of where potential ore deposits might be found. I am very pleased to go through the article on AMD. The article is very useful. I will be glad if you reply for following queries. Will AMD be produced if the tonns of produced coal are kept in open space? How AMD can be prevented in case of open cast coal mining? What should be the best preventive measures in case of open pit coal mining in plain lands where coal is mined from 200-500 metere depth? What is to be done if there is possibility to produce AMD from overburden material?